Any collector will tell you that preserving and maintaining your record collection and stylus is of utmost importance - regular cleaning leads to increased vinyl and stylus longevity. We set out to create the best quality and best-looking anti-static record cleaning brush possible. We guarantee you'll be fully satisfied with our vinyl brush, or receive your money back. Two rows of premium quality carbon fiber bristles effectively lift harmful dust and dirt from the vinyl surface, improving sound quality. Unlike similar brushes, our bristles never fall out. Looks-wise, the matte-finish anthracite colour aluminium housing is purposely understated, and looks great alongside any hifi setup. The initial design for the anti-static record brush serves to remove static from the vinyl and release it from the aluminium handle, through a person's hand/body. Most coloured brushes on the market are not electrically conductive at all (due to the paint layer on the aluminium), so they don't actually have the ability to remove static. Our brush is truly electrically conductive and thus when used correctly, anti-static. Place the record onto platter and switch on power. Hold the aluminium housing of the brush (not the handle) and place it gently onto the vinyl record. HIGH QUALITY + UNIQUE DESIGN - Carbon fiber brush bristles never fall out of the brush. Anthracite colour aluminium housing looks at home amongst any hifi setup. 100% MONEY-BACK GUARANTEE - We guarantee you'll be fully satisfied with our brush, or receive your money back. 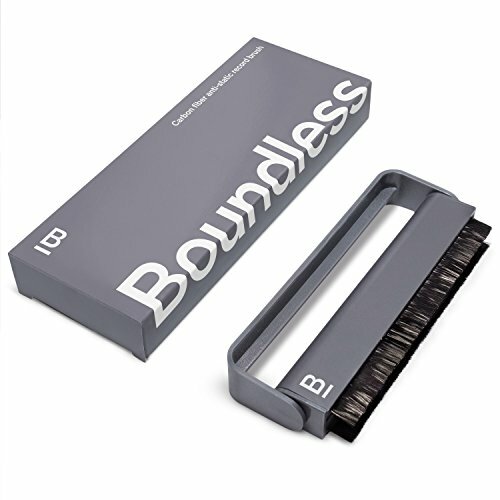 If you have any questions about this product by Boundless Audio, contact us by completing and submitting the form below. If you are looking for a specif part number, please include it with your message.